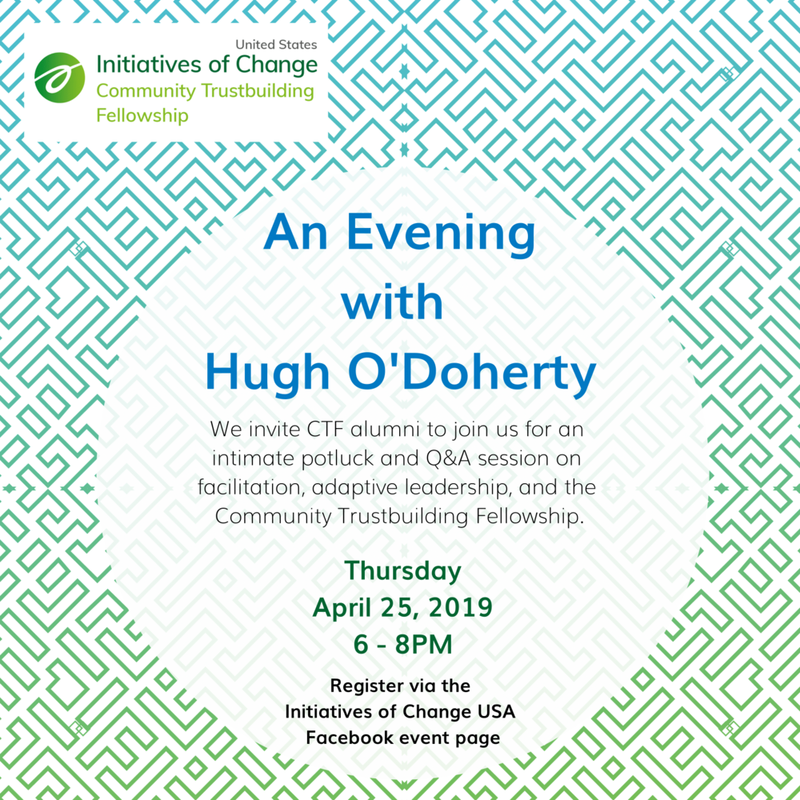 Join Community Trustbuilding Fellowship (CTF) Alumni** and Hugh O'Doherty in an informal Q & A Session about facilitation, adaptive leadership, and CTF. Hugh O'Doherty has served as guest faculty of CTF for more than a decade. We invite CTF alumni to come prepared with questions for Hugh and reflections on his role/impact during your CTF experience. Additionally, this is an informal potluck dinner, so please bring one favorite snack, dip, or dish that you would like to share! This potluck evening will be hosted at the home of a CTF alum in Richmond, VA, and the address will be emailed out to registrants the week of the event. Raised in Northern Ireland, Hugh O’Doherty teaches leadership at Harvard’s school of government and is a Senior Associate with Cambridge Leadership Associates. He has also taught leadership and conflict resolution at the University of Richmond and the University of Maryland. Hugh has consulted with a wide variety of clients, including the Irish Civil Service, the Episcopalian Clergy Leadership Program, and the Mohawk Community Leadership Program in Canada. He has also consulted in countries around the world and has addressed the United Nations Global Forum on Re-Inventing Government. Hugh earned a master’s and doctorate in Education from the Harvard School of Education. **This event is open to graduates and (former) faculty of the Community Trustbuilding Fellowship. Register for this free event on Eventbrite or our Facebook event page.